So here are the latest additions to my Makeup Geek eyeshadow stash. I finally got my hands on my first two Foiled Eyeshadows, my first Duochrome Eyeshadows and expanded my Matte collection with shades from both the old line and the more recent 2015 and 2016 releases. When I looked to swatches of the newer releases, I couldn’t find a lot of swatches that compared them to the old collection. 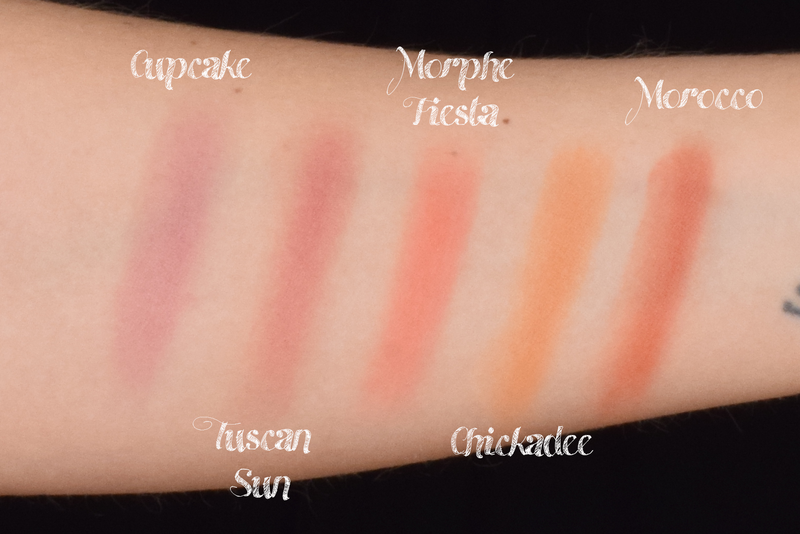 So I thought of adding comparison swatches with both other Makeup Geek eyeshadows as well as eyeshadows from other brands that could be dupes. Let’s take a closer look, in the photo below you can see some of the comparisons I made. Starting with the Makeup Geek foiled eyeshadows, I wanted to try them but didn’t have great expectations for the formula due to all the dubious reviews complaining about the creasing of this formula. These eyeshadows are incredibly pigmented and buttery and this derives from a creamier formula that can therefore be more prone to creasing compared to a drier powder. I have extremely oily eyelids and always apply my beloved E.l.f. Eyelid primer that keeps my eyeshadows from creasing for the whole day (12 hours usually). When I applied the Makeup Geek foiled eyeshadows I found that they started creasing after 6-8 hours, so sooner than usual, but I’d say this is not a cause of concern. I am still happy with the shadow performance and the level of pigmentation and luminosity of these shadows are well worth the few less hours of longevity. The foiled eyeshadows retail for 10$ and 10.40€. Starry Eyed: Light champagne beige with slight pink undertones and a foiled finish. 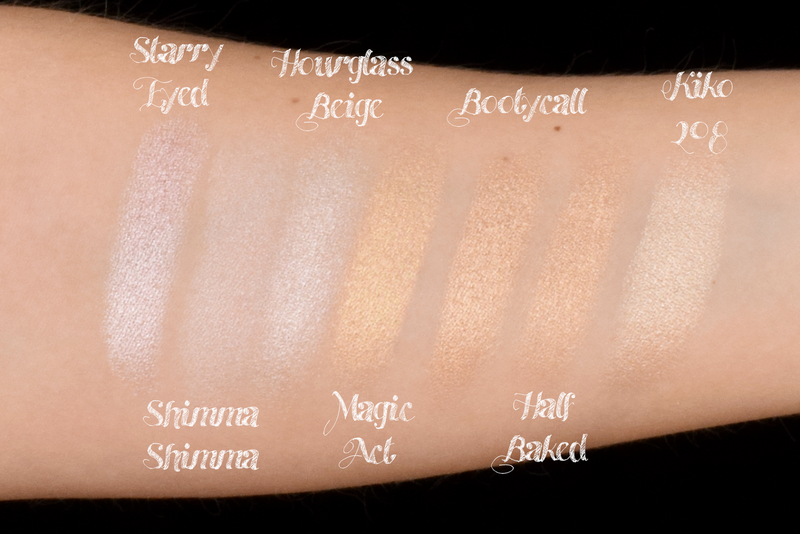 This shadow is much brighter than my usual champagne Shimma Shimma and a bit more cool toned. It comes quite close the the L’Oréal Infallible eyeshadow in Hourglass Beige, but it is creamier and more pigmented still. Magic Act: Light gold with yellow undertones and a foiled finish. I got this shade in the pursuit of a gold pan eyeshadow that is as bright, pigmented and good as the Urban Decay Half Baked shade from the Naked palette. I am very pleased with it and can declare my search complete. It isn’t an exact dupe for the UD shadow, but definitely a good alternative. You can also see that it is quite yellow, as opposed to the Kiko Water Shadow 208, but not as yellow as for example the foiled eyeshadow Fortune Teller (not in the picture). Mirage: Mirage is a warm buttercream with a satin matte finish. This shade was enabled by Gloria of Black Lipstick Society. She was looking for a yellow based cream shade and thought Mirage would be a good candidate. I was curious about the satin finish and knew I would use the color a lot so I picked it up. As expected, the shade is my perfect everyday lid and brow bone shade. The satin finish gives a bit of extra dimension that I personally adore, but it took a few applications to get over the feeling that my brow bone was too shiny. It was all in my head. 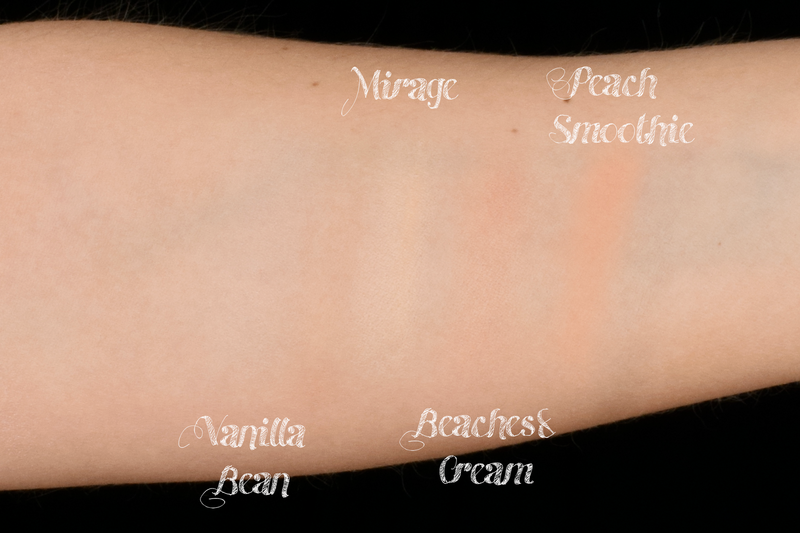 Makeup Geek Mirage is more yellow than Vanilla Bean and definitely not peachy as Beaches & Cream of Peach Smoothie can be. I have been using it like crazy. Thank you Gloria. Tuscan Sun: a medium salmon pink with a matte finish. This is the only shade from the May 2016 release that I picked up and it is definitely a must have shade! It is more orange than cupcake but still on the pink side compared to the yellow-orange hues of Chickadee and Morocco. 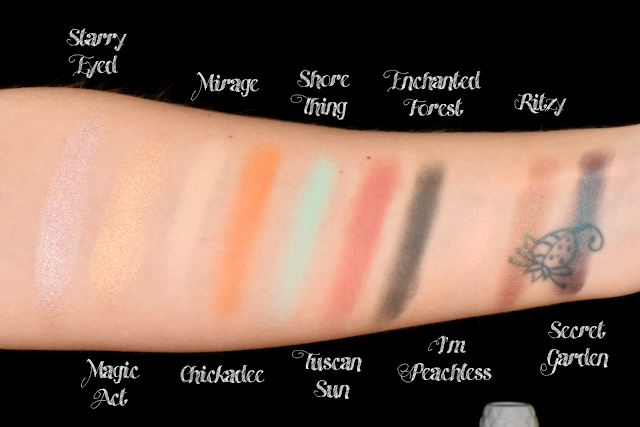 It is also slightly muted compared to Morphe Brushes Fiesta eyeshadow, which is in the same family of colors. Chickadee: Matte Yellow Orange. This is one of those shades that passes through the lines of the more “famous” Makeup Geek eyeshadows, but an incredibly beautiful and useful one. It is a perfect transition shade for any warmer look and makes everything a bit more interesting, compared to Peach Smoothie. I saw this on Giulia from Glitters For Breakfast and I had to have it. Super happy with it. Shore Thing: a true pastel, mint green with a matte finish. 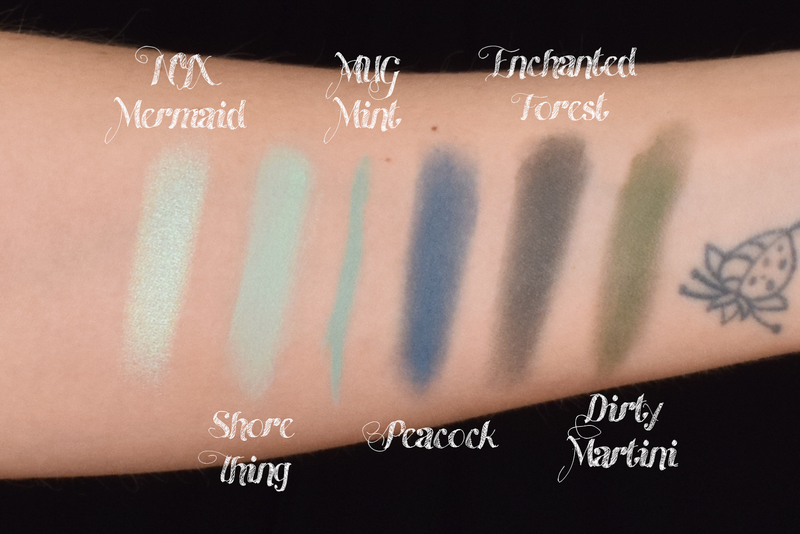 I love mint green in the spring as pop of color in the waterline so I picked up the Makeup Geek Full Spectrum eyeliner in Mint and the matching eyeshadow to set it and smoke it out. I love this shade for this scope, but I find the NYX Prismatic Eyeshadow Mermaid much prettier with all its shimmer. A good alternative is probably the Makeup Geek foiled eyeshadows in Fantasy or Pegasus, even though neither of them are this perfect shade of mint I love. Enchanted Forest: a deep ivy green with black undertones and a matte finish. I wanted a dark outer v shade to use with my green looks and this seemed perfect. Unfortunately the formula is a bit too dry and the green is slightly too cool toned for my taste. I was looking for a darker version of Dirty Martini, but this wasn’t it. A miss. 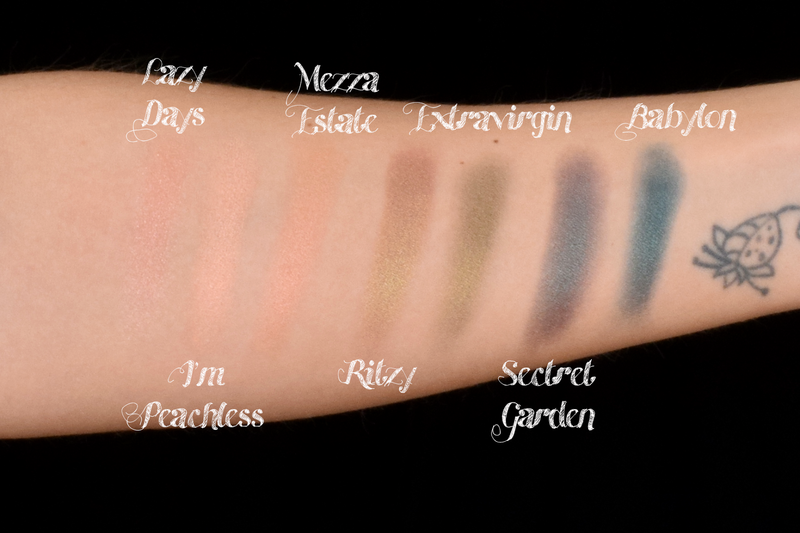 Now to the Makeup Geek Duochrome Pan Eyeshdaows. I love them and I want them all, but for now I only got three of them. I’m Peachless: a buff base with peachy-pink reflects. I wanted this as an interesting lid color and it is absolutely beautiful. Too bad it is pretty much identical to Neve Cosmetics Mezza Estate eyeshadow, including the same duochrome reflects. Lazy Days by Nabla Cosmetics is also quite similar but has no reflects. Ritzy: a warm red-brown base with green and gold reflects. This is possibly my favorite duochromw to put on the lid. The reflects are extremely bright and the warm base makes it incredibly easy to wear on a daily basis. I have nothing similar and the only other green and gold eyeshadow I own, Nabla Cosmetics Extravirgin, lacks the duochrome effect and the warm base. I highly recommend that you pick up Ritzy if you like warm makeup looks. Secret Garden: a deep espresso base with bright teal reflects. I expected this to be a bit more wearable and have a brighter teal duochrome effect. It is absolutely gorgeous but vey difficult to wear if not in a full on dark smokey eye. So here were the last Makeup Geek eyeshadows that I picked up in the first half of 2016. Some were necessary additions to my collection and others a miss. I hope this post of swatches and comparisons helped you and you have a few more shades on your Makeup Geek wishlist. I know mine is never completely empty. 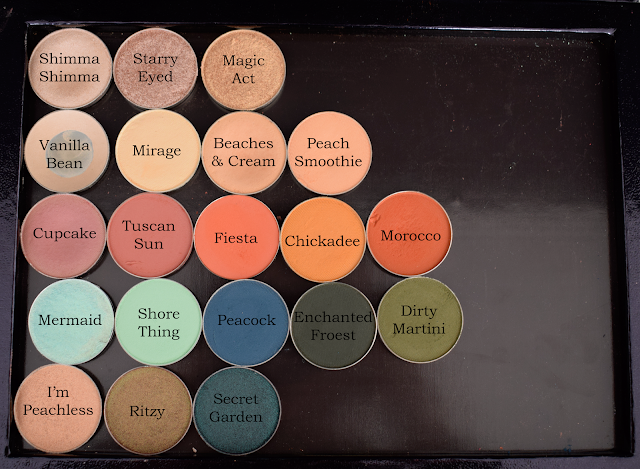 Which are your favorite Makeup Geek eyeshadows? Which ones are on your wishlist?